Q He got a lot of lousy advice, didn't he? MR. 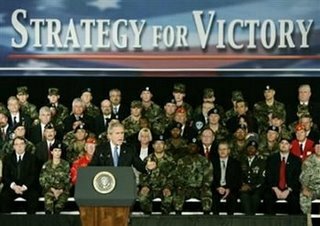 SNOW: Well, he got some advice that -- you know, it's interesting, Bill, you can say about any war that Commanders-in-Chief got lousy advice, because wars never work out quite the way you planned." Yeah, four years later and no end in sight isn't really what you planned, was it? Oh well, I guess that's just the way it goes! 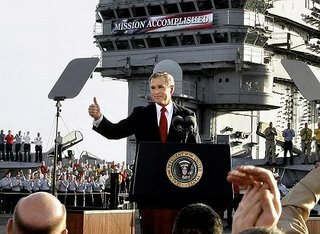 "I think you lost your right to "benefit of the doubt" when Bush got re-elected - it was a tacit democratic approval of his actions by (supposedly) the majority of the country. 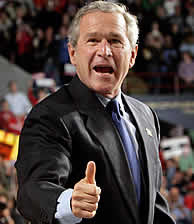 I think your next president will have to do a lot more than "just change direction" to get people back on-side. 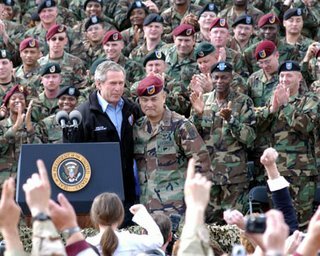 One of the worst things about Bush's tenure has been not just his actions, but the fact that from outside the USA a sizeable portion of your population has been right alongside him, cheering him on and constructing apologist excuses for his excesses. 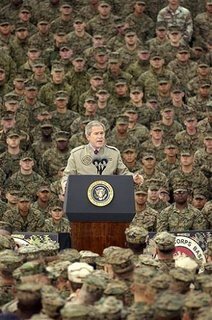 The take-home lesson hasn't been "Bush was an evil man" - it's been "Americans can and will elect brainless vicious egomaniacs, and then often side with them for no better reason than a false understanding of patriotism and a herd mentality". FWIW I know plenty of very cool Americans, and I'm well aware that there was a determined (but ultimately pretty ineffectual) resistance to many of his policies. That's a very nuanced position though, and in the cartoon-vision most people think in it just looks like the majority of you were either right alongside him, encouraging and egging him on as he invaded other countries, abducted innocent civilians and tortured people simply because he could... or you were too fat, lazy and apathetic to do anything other than whinge about it on web comments pages. As I said, I disagree with this unfair perception, but it is the perception you've created for yourselves that you now have to disprove." "Q: Does the President risk using the troops when this morning he talked about if this does not go the way he wants, those troops and their families may have to wait longer for them to come home? MS. PERINO: The President takes great pains not to politicize the troops. But what he was repeating was what the military -- Department of Defense has told him they are going to have to do, since they don't have this money."